As a committed educator, she was on the faculty at the University of Colorado-Boulder from 2008-2015, and has taught masterclasses and lessons throughout the world, including those at the Yong Siew Toh Conservatory in Singapore, the Sydney Conservatory, Hong Kong University, Renmin University in Beijing, the Curtis Institute of Music, among others. She was on the faculty of the Sierra Summer Academy of Music from 2001-2013, the Institute of the Palazzo Rucellai in Florence, Italy, and currently teaches during the summers at the Green Mountain Chamber Music Summer Festival. Intrigued by the relationship between art and social context, Bahn is one of four founding members of MoVE (Modern Violin Ensemble). MoVE is an innovative quartet of four violinists, committed to commissioning music and starting a canon of repertoire for this relatively unknown instrumentation. Composers such as Jonathan Berger, Tommy Dougherty, Jordan Nelson, Daniel Wohl, Jessica Meyer, and Evan Chambers are among the first collaborators with MoVE for its debut season. Along with MoVE, she has collaborated with cellist Matt Haimovitz to produce a program dedicated to ocean/water awareness. Re-imaginings of George Crumb’s Vox Balunae by Jordan Nelson, and Vivaldi’s Il Proteo O Sia Il Mondo Al Rovescio by Adam Borecki and Steve Antosca’s the SOUND: sea beyond the stars comprise some of the program’s premieres at the National Gallery of Art in October 2017.Lina Bahn was a member of the award-winning Corigliano Quartet, which held prestigious residency posts at The Juilliard School, Indiana University and Dickinson College, as well as on summer faculty at Madeline Island Chamber Music Festival, Marrowstone, Canandaigua Chamber Festival, and the Chicago Suzuki Institute. The quartet’s performances have brought them to such venues as The Library of Congress, Alice Tully Hall, Ravinia Festival, Corcoran Gallery, Phillips Collection, Carnegie Hall, and the Library of Congress, and earned them the ASCAP/CMA Award for Adventurous Programming. In 2007, their Naxos Records recording of quartets by John Corigliano and Jefferson Friedman was selected by The New Yorker magazine as one of the year’s “Best 10 Recordings.” The Corigliano Quartet was lauded by the Strad Magazine for their “abundant commitment and mastery”, and praised as “musicians who seem to say ‘listen to this! '” by the New York Times. They have been broadcast on NPR’s Performance Today, All Things Considered, and Backstage Pass, Chicago’s WFMT’s Live From Studio One, and can be heard on the Albany, CRI, Naxos, and Bayer Labels. Chamber music performances have included recitals and concerts in festivals such as the Costa Rican International Chamber Festival, the Sierra Summer Festival, the Grand Canyon Music Festival, the Garth Newel Music Series, and the Festival de Música de Cámara de San Miguel de Allende, and Music on the Hill in Rhode Island. In the spring of 2010, she was on tour with the Takacs Quartet, performing at Carnegie Hall, the Southbank Centre, Concertgebouw, and the Mariinsky Theater. From 1992-1994 she toured extensively throughout Chile with the Bahn-Mahave-Browne piano trio as a recipient of national grants to teach and perform. In 2005, their piano trio was selected to perform for the president of Chile and the King of Indonesia, in Kuala Lumpuur. 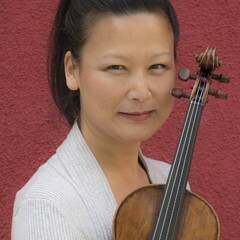 In Washington, D.C., Bahn was the executive director and violinist with the VERGE Ensemble for fourteen years, while it was the resident ensemble of the Corcoran Gallery of Art. The VERGE Ensemble performed in Paris, New York, Cleveland, at the Livewire Festival (UMBC) and Third Practice Festival (Richmond), and was the resident ensemble for the June in Buffalo Festival in 2009. They have performed at Le Poisson Rouge, The Issue Project Room, and the National Museum of American Indians. She is was a member of the National Gallery New Music Ensemble of the Smithsonian in 2010, which gave its inaugural performance in the East Wing, performing works of Xenakis, Antosca, and a premiere by Roger Reynolds. The National Gallery Ensemble participated in the 2012 Washington D.C. John Cage Centennial Festival, with performances at the East Wing, the NGA Auditorium, and at the Maison Française of the French Embassy. These included premieres of composers Christian Wolff, Beat Furrer, Robert Ashley, and George Lewis. As a soloist, she has made appearances with the Chicago Chamber Orchestra, The Chicago Symphony Orchestra, La Orquesta Sinfonica de la Serena (Chile), and the Malaysian National Symphony Orchestra, the Fort Collins Symphony, and Pro Musica Colorado Chamber Orchestra. Solo recitals include those at the Phillips Collection, The Stone, Issue Project Room, and at The Corcoran Gallery of Art. She has commissioned numerous new works including those by Benjamin Broening, Ken Ueno, Dan Visconti, Jeffrey Mumford, Adam Silverman, Steve Antosca, Keith Fitch, Daniel Wohl, among others. Bahn studied with Dorothy DeLay at the Juilliard School for her undergraduate degree. She completed her Masters degree as the recipient of the Jane Bryant Fellowship Award under the tutelage of Paul Kantor. Her Doctorate in Music is from the Indiana University, where she was an Associate Instructor and studied with Miriam Fried and Paul Biss. Dr. Bahn’s early training in Chicago started with Lillian Schaber and she finished her high school years under the guidance of Roland and Almita Vamos.